According to Remodel Works, a 30-year-old, family-owned San Diego design build firm, room additions and kitchen remodeling in 2015 have spiked in demand. Just in the last year, Remodel Works has continued to grow and the remodeling industry has regained its strength. With growing demand, room additions are becoming increasingly popular for those who want to stay in their current home but are recognizing new needs. Remodel Works Bath and Kitchen is a San Diego-based design-build firm that has been serving San Diego community members for over thirty years. Remodel Works has long been known for their quality bathroom and kitchen remodels but is now going to be placing an equal emphasis on room additions. Remodel Works has successfully expanded dining rooms, added on storage rooms, created new rooms for new family members, and many other projects. While Remodel Works has always done room additions, it hasn't been a primary focus for the company. With growing demand, room additions are becoming increasingly popular for those who want to stay in their current home but are recognizing new needs. Remodel Works is responding to this growing need in the San Diego community by making room additions one of their three primary product offerings along with bathroom remodels and kitchen remodels. San Diego is a place that people come to from all over the world to raise their families. The San Diego community is full of growing families with changing needs, which is why the remodeling and home improvement industry is in such high demand. For most a house is not just a building they live in, it is a huge part of their lives, a place where their family can grow together and where memories of a lifetime are built. As a family grows and changes, people often turn to moving as an option which can be stressful and expensive. San Diego Room Additions on the other hand, can be a great investment in a home, whether it is adding another bedroom, expanding a living room, adding on a sun room, or even an entertainment room, nothing is out of the realm of possibility. In addition to providing much needed space, a room addition will allow a family to stay in their home and also add value to their home if they decide to sell. In fact, according to the 2015 Remodeling Cost vs. Value Report, California is predicted to see at least 7 projects that will return 100% of an investment. In fact, kitchen remodeling still tops the list as being the best bang for a buck and many kitchen remodels will require a minor room addition in the San Diego region. With a booming home improvement industry, remodeling firms are plentiful in San Diego but it can be difficult to find a company that is reliable, consistent and provides quality work. 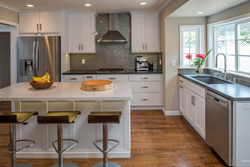 Remodel Works Bath and Kitchen has been recognized with awards from Angie’s List, U.T. San Diego, and many others for their excellence in both customer service and project quality. Room additions are large projects to take on and often require contractors to be in the home anywhere from one to four months. This is often due to the fact that room additions can be quite complex with electric, plumbing, central air conditioning and much more. When choosing a company to come into a home for months at a time and often working alone in a home for extended periods of time, it is important to choose a company that can be trusted. As a family owned and operated company, Remodel Works has an outstanding track record working with families during the remodeling process. Many customers have taken the time to voice their opinion of Remodel Works on various reviewing sites, overall they are overwhelmingly positive. Remodel Works provides customers with a detailed schedule of who, what, when, where, and why. Knowing what is going on in a home will make the entire process much less stressful. In addition to requiring a time investment, room additions come with a substantial monetary investment. A common issue with home improvement is hidden fees and surprise costs that come up throughout the process, adding thousands of dollars of extra work to the project. What makes Remodel Works different is that they will provide their customers with an upfront, set budget they guarantee will not fluctuate due to hidden fees. Going into a home improvement project, most people have a set budget that they have decided upon; it is important to find a company that will work with a budget not against it. This is very important especially considering the high cost fees that can be incurred for any changes. Remodel Works Bath & Kitchen has proven their abilities to many San Diegans and have been thought of as the best kept secret of San Diego’s home improvement industry for some time. Providing more room additions services is just another way Remodel Works can prove themselves to home owners in the community seeking quality work and consistent customer service. For the last thirty years Remodel Works has created one happy customer after another, having served over 10,000 satisfied San Diego residents, it looks like over the years they are only getting better at their craft. For a room addition of any size or design, Remodel Works Bath and Kitchen seems to be San Diego’s choice for making your house a home.